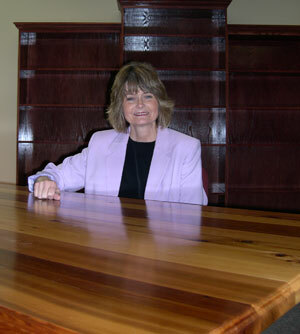 Mass com chair Glenda Balas sits behind the handmade cedar table that is located in the new conference room on the Dan Rather Communications Building's second floor. The facility's refurbishment is just one of many changes Balas has in store for the department as its new head. Glenda Balas may have only taken over as chair of the mass communication department in July, but she ”hit the ground running” and the changes are literally visible. New paint, new carpet and a new conference room, including “one of the most gorgeous tables I’ve ever seen” (a cedar table handmade by the Physical Plant), a reclaimed second studio and a new editing suite on the third floor are among the facility renovations and refurbishments students will notice when they begin classes on Monday. But that’s not all Balas has in store for the department, with plans including two new “high-profile hires” as the Dan Rather and Warner chairs; the expansion of operations for the television station, including a student management structure that would allow a larger presence in the community and increased service; a mass communications fellows program, “for high-ability students;” an advisory board; and a new master’s program in digital and convergent media, which would begin in 2010, pending application acceptance and approval. Balas comes to SHSU from the University of New Mexico, where she taught and served as an associate chair for seven years. She previously taught at DePauw University in Greencastle, Ind., and worked in the media industries, largely in the non-profit and public broadcasting sectors for 17 years. Balas earned both her bachelor's and Master of Business Administration degrees from ENMU and her doctorate from the University of Iowa. She’s also an award-winning documentarian. Her “hybrid” academic documentary, “The Long Road to Decatur: A History of ‘Personal Influence,’” based on the very famous academic book, was recently awarded first place by the National Federation of Press Women. “Over the years I’ve done print; I’ve done TV; I’ve done public relations; I’ve done advertising and then I’ve taught in all of those areas,” she said. “I’m a generalist (in terms of specialties). “That’s one of the reasons I’m so interested in multi-platform applications of mass communication, because I do think that if we can train our students to be able to participate broadly in the mass communication industries, they will have a vital and vibrant career, because they can participate in different things,” she said. In the spring, Balas will be on leave for the semester as part of her Fulbright grant to serve as research chair for globalization at Dalhousie University in Halifax, Nova Scotia. Balas said she’d kept SHSU on her “short list” of potential places of employment ever since her son, Jason, taught in the radio/television program. Though Balas has only had the opportunity to meet the summertime mass communication students, she said she finds them “energetic, bright and curious. “They have a sense of themselves as having a contribution to make,” she said. “I’ve worked in other places, I’m familiar with students from other schools, and sometimes these students don’t self-perceive of themselves as being potential players in the broadcast industry or print industry; they see themselves as not having a real role to play. While she does have a shopping list of changes she will work to implement during her tenure here, one of them is not the curriculum. “The faculty has been working on curriculum design for the past five years, and it’s a very solid curriculum,” she said.